If you're a green smoothie gal, this shake is for you. 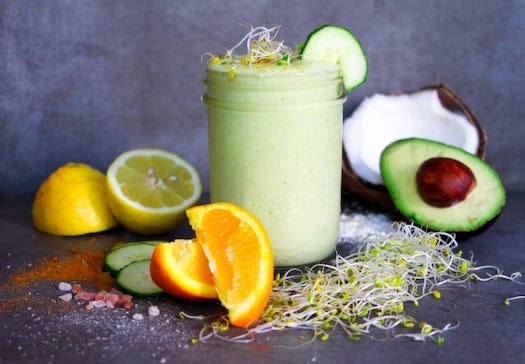 It's light, refreshing, and full of nutrient-dense, alkalizing ingredients. Broccoli sprouts are hotter than the celery juice craze right now. These little guys are powerful anti-carcinogens, assisting the body in releasing free radicals. This shake is a daily lifesaver, literally. Add all ingredients to a high-powered blender. I recommend adding the peeled orange and cucumber first, so the natural juices form the liquid base. That's why we only need to add a splash of coconut water. Pulse until smooth. *We love Primal Kitchen’s Vanilla Collagen FuelTM **Try adding frozen pineapple and mango (reduce the amount of ice) to this recipe for a tasty variation.